UNIVERSITIES remain the top choice for many young Sarawakians wanting to pursue further education. 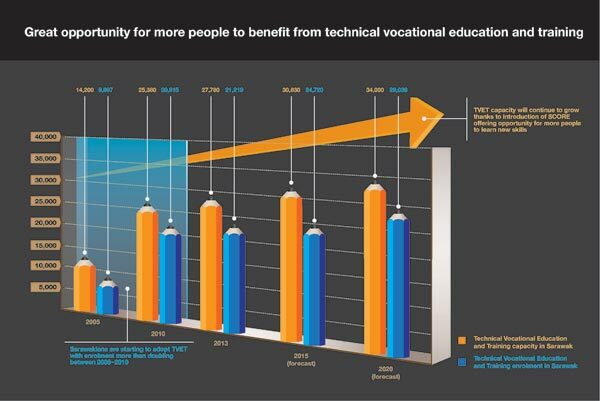 However, Technical Vocational Education and Training (TVET) is now emerging as an increasingly popular option for students wanting to learn new skills. Under the 11th Malaysia Plan from 2016 to 2020, the government has allocated RM1 billion for a Skills Development Fund to enable more students to receive skills and vocational education. “Under the programme, those who had undergone Technical Vocational Education and Training have the opportunity to gain employment with a high income and value-added in such sectors as the oil and gas, aviation engineering, shipping and automotive,” said Prime Minister Datuk Seri Najib Tun Razak on Thursday. There are some obvious reasons why demand in this area is growing, though the Sarawak government would like to see a greater number of people adopt this path to help fill manpower gaps forecast in the years ahead. Thanks to the introduction of the Sarawak Corridor of Renewable Energy (SCORE), a large number of industries are bringing fresh investment to the state. With that investment and expansion comes the need for more skilled workers. This presents a unique opportunity for young people in Sarawak to undertake the necessary education and training to meet the skill needs for these industries. The graph shows the solid growth in enrolments in TVET in Sarawak in recent years, and the continued forecast growth through to 2020. While these numbers are encouraging, much work remains to be done to convince people that the career opportunities offered via this path are not only worthwhile and viable, but also financially rewarding. Chief Minister Datuk Patinggi Tan Sri Adenan Satem recently underlined the government’s commitment to this field of study and his desire for more Sarawakians to make it a serious consideration for their education. “Technical education is the ‘thing’ now, plus of course some academic qualifications. We need people who know how to work with their hands, people who are skilled and professional. The demand for qualified people especially in technical and scientific fields will grow and grow,” he said. This column last week highlighted the need to produce 40,000 certificate holders annually in Sarawak in keep up with the job demands just for SCORE projects. Currently, there are 92 TVET institutions in Sarawak, producing 25,000 certificate holders every year. The government is investing in schools, colleges, technical universities and vocational training institutions in an effort to have sufficiently-trained local people to meet the skilled manpower needed over the longer-term. In the short-term, manpower will likely need to be imported to ensure SCORE continues to grow and build on it’s already robust expansion plans. Deputy Prime Minister Tan Sri Muhyiddin Yassin recently pointed to the examples of countries such as France and Germany along with regional neighbours Indonesia and Singapore, who have placed greater emphasis on the needs for more education in these areas. He said the government would increase the number of TVET institutions in Sarawak to help produce more highly skilled workers to meet growing demand. “The requirement for highly skilled technical and vocational workers in the country now is very high as the country is heading towards industrialisation and in this context, Sarawak is not the exception with the development of the Sarawak Corridor of Renewable Energy,” he said. To underscore the importance of this issue, Sarawak will host the World TVET 2015 Conference from August 25-27 under the theme ‘Quantum Leap: Transformation and Globalisation of Technical Vocational Education & Training: Living Skills in the 21st Century’.